Spotify undoubtedly has many things going for it, but its boss’s comment might make many a true music fan take pause. It definitely goes some way to explaining why I’ll be hanging on to my cassettes. They are anti-moment, demanding patience and time-investment. The famous soliloquy in Nick Hornby’s ‘High Fidelity’ explains the gentle art of compilation construction. Who didn’t try to woo someone with a well-crafted comp? I’ve still got mutant compilation tapes made 20 years ago which mix up tracks from all kinds of sources: albums hired from the library, albums borrowed from friends, tracks taped from the radio and maybe even a bit of homemade Zappa-style spoken-word weirdness by myself or a few friends. Then there are the teenage band rehearsals recorded on a brilliant Philips boombox. Wish I still had that. I swear it made better recordings than a lot of digital four-tracks I’ve heard since. And then there’s the cache of gig tapes recorded directly from the sound desk of various London venues. I barely listen to them but there’s no way I’m gonna chuck ’em. Then there are the official album releases. I like the way they sound slightly different on every player. My favourites are probably the grey and black Warner Bros ones of the late-’70s/early-’80s: to this day, Little Feat’s Time Loves A Hero, The Doobie Brothers’ Livin’ On The Fault Line and John Martyn’s Glorious Fool sound so much better on cassette than on CD, with improved dynamics and top-end. Cassettes were always subtly subversive though – Malcolm McLaren masterminded his band Bow Wow Wow’s (cassette-only, of course) release of 1980 mini-album Your Cassette Pet as a reaction to the ‘Home Taping Is Killing Music‘ protest. He also named their debut single ‘C-30 C-60 C-90 Go!‘ in tribute to the humble tape. And the ‘punk’ element of cassettes has also definitely been picked on by Zack Taylor, director of a new documentary called – you guessed it – ‘Cassette’, showing later this month at London’s East End Film Festival. 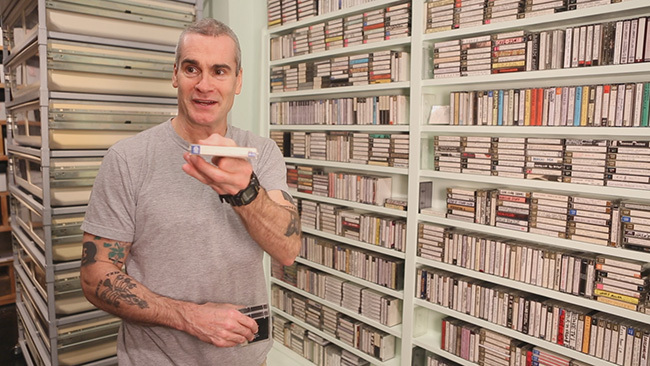 It features the likes of Henry Rollins (right), Thurston Moore and Ian McKaye waxing lyrical about the format which seems to be enjoying a resurgence in the US – cassette sales are on the up and there are reportedly more cassette-only labels than ever before. This is all great news. Long live the cassette.